In the Northern Sporades the larger islands of Skopelos and Alonissos offer the most as well as some of the most beautiful anchorages. Invariably, these secluded and enchanting natural harbours can be found on the south or south west coast, protected by the usual northerlies and the northern storm winds of the Meltemi. Skopelos is located near the nature reserve NMPANS, which protects the Mediterranean Monk Seal but of course also a plethora of sea birds, turtles and marine mammals. Indeed, you can see lots of dolphins and whales in this area of the North Aegean Sea. Note, that the east Aegean and not the north is famous for its luxurious gulet cruises. Gulets holidays are usually fully crewed and you will enjoying your own chef cook as well as for instance full air-conditioning. Most of these so-called blue cruises start out of Bodrum, Marmaris, Gocek, Fethiye and Kos or Rhodes. The ideal equivalent of a Gulet (Goulette or Caique) in the Northern Sporades is available on super yachts or mega yachts. Most yacht charter companies rent out yachts and organize sailing holidays from Skiathos port, next to the Marina. Skiathos also has a small airport there and the airplanes seem indeed to be landing on the sailing yachts. The other way to reach Skiathos is by ferry or hydrofoil from the port of Volos or directly by bus or ferry from Athens. 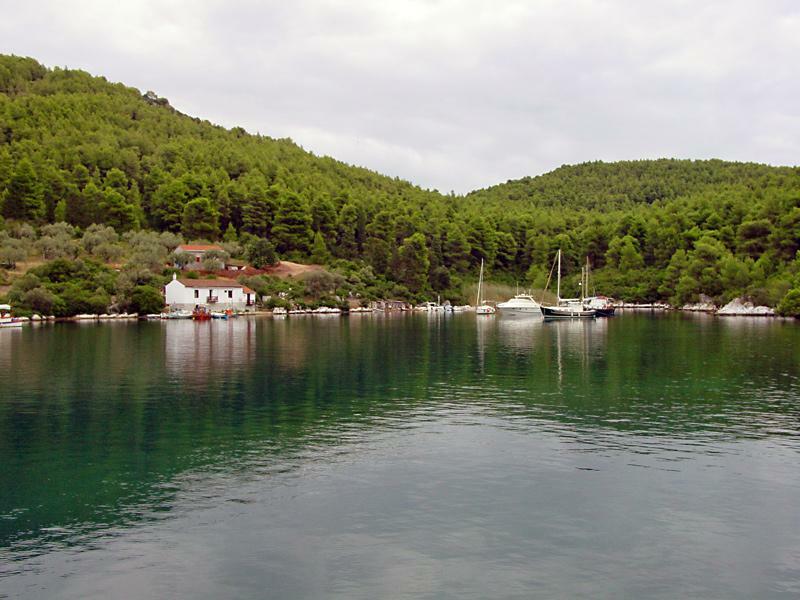 The photo shows the southern arm of Panormos bay on Skopelos looking south.